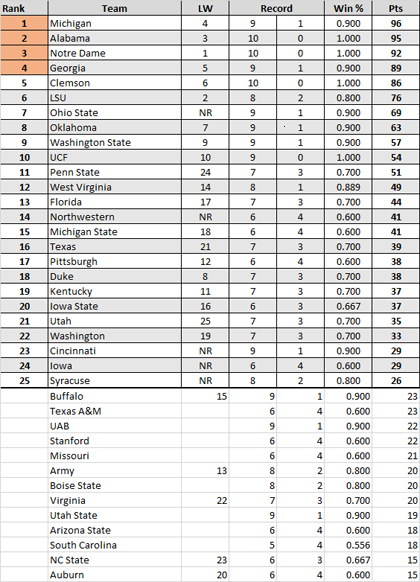 To be fair you cant compare the BCS system to this. Knowing what I know about "computer gamblers" in horse racing, to discount all models is probably a bad move. The system is holistic, not week-to-week. And understand the rankings will change dramatically over the final 4 weeks of the season. - LSU has played a much stronger schedule than Alabama and is rewarded for it, despite the loss. That said, it is unlikely they will maintain their lead beyond this week. - Clemson's strength of schedule took significant blows when Texas A&M and Syracuse dropped out of the rankings. - WVU improved to 39 points by gaining 16 points for their win over Texas (15 points for a win over #21 + 1 point for it being an away win) and not having their SOS damaged. In week 10, they were just outside the Top 25 with 23 points (25th held 25 points). - Pitt beating Duke does not matter beyond the points they earn for the victory, except as a tiebreaker were they to hold the same number of points. - Duke has played a better schedule than you give them credit for, and have won 4 games on the road against P5 teams with at least a .500 record (@Northwestern, @Baylor, @Georgia Tech, @Miami) - the .500 record requirement is not arbitrary, it is rooted in the requirement for bowl eligibility. They also hold wins over Army, Pitt, and Virginia, all of whom are ranked. Is it surprising to see them ranked as highly as they are? YES! Of course! But that is where they belong for Week 11. - Georgia gained 11 points. That means more than their lack of movement in the rankings. Test your own logic: where were they supposed to go? Above Notre Dame? LSU, whom they lost to? Were they unfairly jumped by Michigan and Alabama? - Ohio State's schedule is hurting them badly; to this point, Penn State has played a tougher schedule. I appreciate any comments or suggestions for improvement anyone may have. I am always looking to make adjustments! Your explanation doesn't make your ranking system any less trash. It's awful. Significantly worse than what the BCS, CFP committee, AP or coaches put out. My suggestion is stop relying so heavily on SOS while discounting head to head matchups. Also, don't quit your day job. 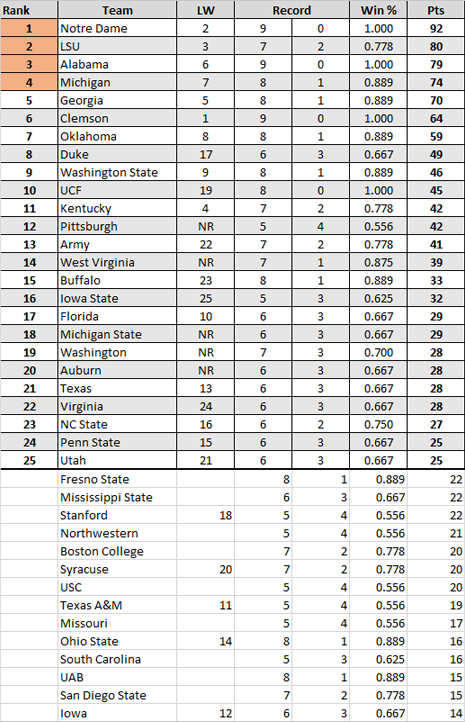 I've considered basing some points on the win% of teams above .500. That may reduce the likelihood of these sorts of (seemingly) inappropriately ranked teams. No, it is not a system where rank is frozen once a game has been played. LSU is receiving 10 points for their win over Miami and 16 points for Auburn. A Top 10 victory would earn them 25 points. My rankings do not begin until after Week 7. Up to that point, I simply collect the wins and losses. I think you're wondering how I arrive at my rankings without a pre-season ranking. What I do is rank with the "raw numbers" first, which is simply points for wins and losses without any modifiers. Then I input the rankings based on that, and they automatically update throughout the entire spreadsheet from the "Teams" page. As you probably guess, this creates a lot of chaos with teams moving all over the place, and you're right. I continue to the process of sorting them ranking and inputting until it "settles" - I eventually reach a point where there is no more movement. This probably takes about 15 minutes. I do not use any outside rankings. This is exactly that happens, and why there is so much fluctuation week to week and how a team can jump from NR to Top 15 and back down again. No, criticism is good! I am always looking to make this better. My rankings do not begin until after Week 8. Up to that point, I simply collect the wins and losses. Appreciate the responses. As i said not trying to tear you down, but curios/would like to help. The points automatically adjust within the spreadsheet. The only things I have to do manually are input the scores and sort the rankings. BTW, if there are any Excel wizards here who would know how to get the spreadsheet to complete the rankings on its own, that would great! Wins over P5 =>.500 teams earn 10 points, wins over similar G5 earn 7. But, I'll admit this may need tweaking. As I said before, I have been considering modifying points based on opponents' win%. The most time consuming part of it was developing the spreadsheet itself. Getting the formulas right and making sure they work properly can be a real pain in the . Plus, a page for every FBS team. But spread out over the long off-season makes it not bad at all. Every once in a while I get the time and energy to plow through a bunch of it. During the season, I can input all the scores and sort the rankings in about 2 hours, which are typically spread out Sun-Wed. I like to have it done before the Thursday games. Head to head simply cannot matter that much in a points-based system. In all such systems, it is a tiebreaker. Not comparing this to anything, but to place a 5-4 team at #12 after being not ranked, again WTF? No way I can it take it seriously. Hey I did this stuff with my marbles when I was kid in my imaginary world! I like some of your thoughts. Looks to me like more wieght for wins would help. It is EXTREMELY hard to go undefeated. Only four teams listed with zeros in the L column. Subtract 5 points for every loss? Multiply win percentage times published points to come up with 'final' points? What 4 teams get in? It'd be a tough call. Notre Dame has the head-to-head, but Michigan has the tougher schedule and would have more quality wins, arguably(and according to Sagarin, for whatever that is worth), and a conference championship. Personally I would keep ND out just because they refuse to join a conference. For those that want the playoffs expanded, the best case scenario is Georgia beats Bama in the SEC Title game, Clemson wins out and Notre Dame wins out. In the scenario, I would guess the committee takes those four: #1 Clemson, #2 Notre Dame, #3 Georgia, #4 Bama - which would leave out the B1G (1-loss Michigan or Ohio State) Big XII (1-loss Oklahoma or 1-loss WVU) and Pac 12 (1-loss Wazzu), plus a likely undefeated UCF again. Obviously no one wants to see two SEC teams in again, but when 3 Power conferences get their 1-loss champions left out, that's when changes will be brought to the table. I completely agree. This is the exact scenario I’m rooting for. Chaos baby! Yes. I’m not sure if that’s entirely fair, but the media has been hyping Michigan more than any team other than Bama. As a ND fan, I’m a bit annoyed how the talking heads conveniently leave out ND won that game w/o Book as the starter and their best RB, Williams, suspended. Harbough factor. He's quotable. Hard to believe anyone can get media hyped quicker for less than ND but since Harbaugh has been at UM, I'd say they qualify. Both could be legit though this year. ND is a legit playoff team, but they’re not a threat to win it all. They might be able to give Clemson a game but their DL will be a nightmare matchup vs ND’s OL. ND’s Defense can make it a game, they’ve got 3 NFL quality edge rushers, 2 stud LBs who are great vs the run and capable in cvg, and a lockdown Corner. This would be a great year for UCF to get in there, get waxed, and then end the nonsense of non-power five schools getting into the CFP. If the Committee is smart, they’ll match them up with UGA. Unlike Auburn, they won’t be crushed mentally by a loss in the SEC Title game and they’ll come ready to play. Last edited by Omar; 11-19-18 at 01:19 PM..
Ohio State's play on the field is hurting them badly. In college football, and win isn't just a win. You have to judge each game accordingly. Saturday for Ohio State had to be a dagger for the season for them from a playoff standpoint. Even if they beat Michigan and Northwestern, there is no way you can put them in the playoff. They have sleptwalked through most of the last 3 games, hungover from the Purdue game. The Buckeyes best win is Penn State, who has 3 losses, and TCU, who has 6 losses!! I agree! Ohio State has been less than impressive this season! But I'm also confused. Why did you post this as a response to my post explaining my rankings??! I think this weeks rankings have officially shut the door on Ohio States Playoff chances. I really don't see an avenue where they can jump into the top 4. A win vs Michigan would move them up maybe a few spots but beating Northwestern wouldn't move the needle enough to get them in.